Eat Your Heart Out, Edith Hamilton! again. And no, this isn’t a re-run. It’s the Athens to that soup’s Sparta. Their soup, on the other hand, I am quite thrilled with, especially this one. It started out as the Greek counterpart to my Caprese Soup with fresh tomatoes making what may be their final appearance of the summer. The tomatoes starred alongside cucumbers and oregano, which took the place normally occupied by the Caprese’s basil. Then I garnished the soup with crumbled feta cheese which would take the place of the mozzarella, but since I’ve got a few readers who don’t eat dairy, I decided to make that optional. I also made the feta optional because it really changed the nature of the soup. It was still really good but it was also a lot more provocative. Not that stirring feta cheese into a pot of soup is an act of aggression or anything, but, because I’m the only one in my family who actually likes the stuff, it wasn’t terribly diplomatic either. Without the feta, the soup is more rustic, mild-mannered, and governable. It’s more accessible too. Either way, the family focus group gave it a total of six thumbs up (I didn’t vote), the only complaint being that I had taken it off the stove too soon and it had gotten cold. Of course, if my kids actually had the godlike powers they’ve been pretending to have all summer, they could have warmed the soup back up with a quick lightning bolt, or used Athena’s wits to figure out how to reheat their bowls with starlight. They could even have appealed to Hestia, goddess of the hearth, to make it all better. In the end, though, it was just Mom and Dad, arguing about whose job it was to put the soup back on the stove. Not a Peloponnesian War or anything. Just the kind of lively debate you have in any healthy democracy, or marriage. * For those of you who haven’t heard of these books, they’re a lot of fun. The conceit is that the Greek gods are alive and well, living on the 600th floor of the Empire State Building. Since Mount Olympus represents the heart of Western Civilization, it moves with center of Western culture. Greece, Rome, … New York. Make sense? The main characters are teenaged children of the gods and contemporary mortals. They’re called half-bloods or demigods. 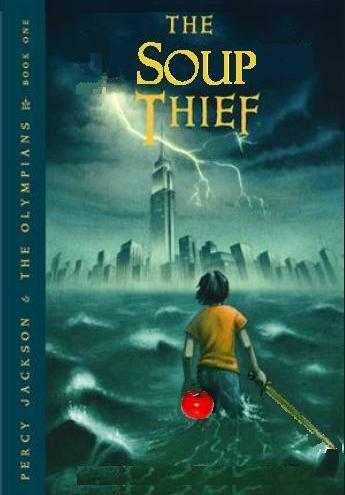 Rick Riordan is the author. Check the books out here. Not literally. This isn’t a library, people. Slice cukes and tomatoes and place in a pot with stock and oregano and seasonings. Bring to a boil and reduce to a simmer for 20-30 minutes. Image Credit: The author’s creative alteration of a well-known book jacket design. Note the tomato and the cucumber sword. Any questions, Shepard Fairey? The Greeks get a lot of credit in Western Civilization simply because they got there first. I’m happy to give them their due when it comes to food. Just not pi. What do you think? I’ll be reading and responding. I don’t know if balance is the way things play out in Greek theatre, but I hope the soup brings some well earned relief from all the eye-gouging and dad-killing. That is pretty heavy stuff for a 10-year-old. I just hope the soup is light enough. Thanks for the comment.